The Life Fitness X5 Track Cross-Trainer is much like an elliptical with an advanced FlexPedal Absorption System that delivers even more comfort and less impact than that average elliptical trainer. This luxury-priced home trainer is perfect for multi-user households and comes complete with a manually adjustable stride length that can be adjusted in 2-inch increments between 18 inches and 24 inches. If you have always had difficulty with units that only offer a fixed stride length, this may be the solution. Priced at $3899 on Amazon.com, the X5 elliptical is a durable machine that comes complete with features you would expect to find in commercial equipment. Read this unbiased review, and decide whether or not to invest in the X5 cross-trainer. If you are looking for a cross-trainer that will deliver an upper and lower body workout, this could be the perfect machine to tone your arms and legs while you get your daily cardio. Two of the things that make the X5 unique is its use of Life Fitness’ SelectStride technology and FlexPedal Shock Absorption System. SelectStride is a track console system that is easy to use so that users in the household can select the stride length that is most comfortable for them. This results in more comfortable workouts with less strain on the legs, shoulders and back. The FlexPedal Shock Absorption system puts less stress on the knees and ankles by allowing the foot pedal to flex. If you want an effective workout that does not put unnecessary strain on vulnerable areas of the body, this is the machine for you. With the Life Fitness X-5, you never have to feel like you are missing out by skipping the gym. 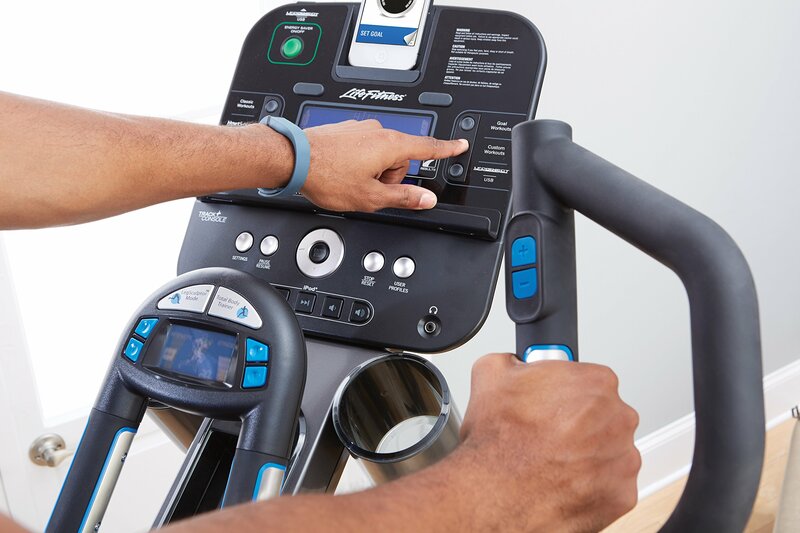 This home machine comes complete with customized workouts and a CoachZone. You can choose from 14 different workouts that can be stored on 4 separate profiles. In addition to these pre-programmed settings, there is a feature that will give you your very own in-home coach who will motivate you and help you select workouts that will target the muscles you are trying to train. If you want to track your progress or even go social with your performance, the LFconnect tool is just for you. By using this website, you can join a community of fit individuals and share your progress so that you stay accountable. In the world of fitness, accountability is key. The Life Fitness X5 elliptical Cross-Trainer is an award winning home trainer that uses commercial grade parts and technologies. If you are interested in buying a unit that you could easily find at the gym, this could be the unit for you. With an adjustable stride and shock system that protects you during your workout, you can easily go for long periods of time in your own home. Be sure to compare the features of this luxury unit with those of other units on the market such as the Life Fitness X1 and X3 so that you can decide if the Life Fitness X5 is the right model for you.